Kimberly-Clark has announced a product recall of a limited number of its Kotex Natural Balance Security Unscented Tampons, as there are related health concerns. The Product SKU numbers are the last five digits of the product’s barcode and can be found on the bottom of the package. The tampons were manufactured with a raw material contaminated with a bacterium, Enterobacter sakazakii, which may cause health risks, including vaginal infections, urinary tract infections (UTIs), pelvic inflammatory disease or infections that can be life-threatening. Women with serious existing illnesses, cancer or immune-compromised conditions, such as HIV, are at increased risk. There is limited evidence of transfer between individuals with this bacterium. The tampons affected were shipped to retail customers between October 29, 2011 and November 2, 2011 in specific Wal-Mart stores in Iowa, Kansas, Missouri, Nebraska, New Mexico and Texas; specific Fry’s stores in Arizona; and specific Smith’s stores in Utah and Arizona. Not all stores in these states were impacted. 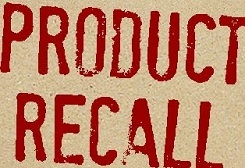 All impacted stores have been alerted to remove the recalled product SKUs from shelves. A listing of stores impacted and the latest information can also be found on the Kimberly-Clark website and the Kotex brand website. Consumers should contact a physician immediately if they have used the recalled tampons and experience unusual vaginal discharge, rash, fever, headache, vomiting or abdominal pains, particularly if they are HIV positive, have AIDS, cancer, an existing serious illness or may be pregnant.